Midland Meander Education Project, one of the projects Thatu has been funding for some years now, continues its good work in the Howick area of KwaZulu Natal. Established in 2004, the Midlands Meander Education Project (MMEP) provides meaningful education to 20 schools and reaches over 6000 children annually, covering the area from the Cedara to the Mooi River in South Africa’s KwaZulu-Natal region. The organisation is deeply familiar with the challenges learners and teachers face and has designed a programme that responds to the specific educational needs and gaps within the education system in under-resourced schools. Their purpose is to provide supplementary, relevant, meaningful educational services at a local level. The education programme focuses on food security, environmental sustainability, basic reading, writing and maths skills, technology and life-skills. The MMEP also runs Eco-Clubs, a supportive group for vulnerable children (Superbug Group) and a Gap Year programme for school leavers. In addition they host teacher’s workshops and has initiated two supportive community networks to strengthen partnerships and the work they do. Thatu began supporting MMEP in 2008 by helping to fund their work to create sustainable food gardens in schools within KwZulu-Natal. These gardens were used not only to produce much needed food which was used in the school kitchen but also as outdoor classrooms to help bring various subjects to life! We still continue support the work within schools which whilst still includes the food gardens, also covers broader educational needs . In additional to this, MMEP approached us a few years ago to support a pilot scheme of the ‘Super Bug Club’ which was to be group that meets monthly and is a safe space for vulnerable children to talk. It is run by a social worker who would conduct various activities to help the children open up about the difficulties they are facing from bullying at school to abuse at home. The same group of children attend the club for an allocated amount of time with the idea that they would ‘graduate’ from the group and hopefully go on to be mentors for future members. It was quite an experience for both Thatu and MMEP to develop the scheme and the content and we are very happy to say that the club is still in existence and the children that had some truly special experiences and opportunities. 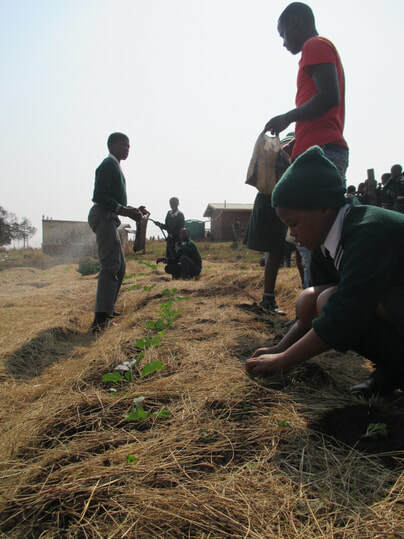 Thatu’s sponsored sustainable food gardens based in primary schools in Howick, KwaZulu-Natal continue to thrive. Midland Meander Education Project run the scheme and are now involving the local communities around the schools - one benefit is to help bring back roaming chickens and goats! 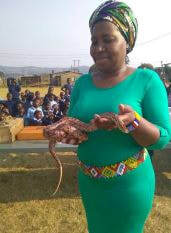 The project teaches permaculture in schools, hosts community workshops and works with local partners like Snake Country on snake and diversity talks. The vast number of pupils at these schools live in poverty and rely on the school feeding scheme as their main meal of the day. 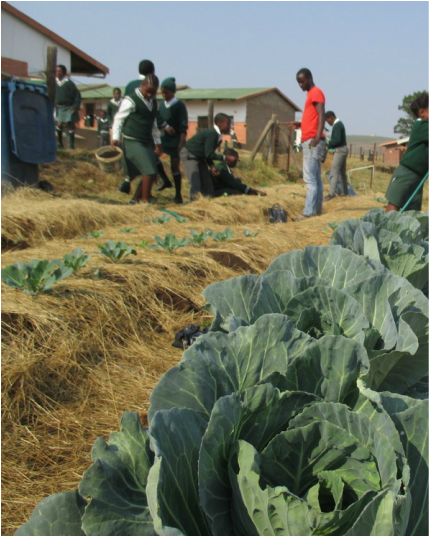 With MMEP’s support, these schools are able to contribute fresh, organic food to their state-aided and often inadequate feeding scheme and provide learners with skills to start their own food garden at home. In our latest update from MMEP in June 2017, visits to Haza and Sibongumbomvu in particular focused on teaching children about certain aspects of permaculture (a sustainable & self-sufficient gardening ethos) which included the delights of worms and how they both aerate the soil and provide it with nutrients. During the lesson the children went out into the school food garden and planted seedlings and made sure to add mulch to the soil to improve soil fertility. These gardens continue to faces challenges with the Haza Primary School having no municipal water supply and being reliant on storage tanks, water is scarce and the gardens can suffer as a result. MMEP ensure that during each of their visits they do remind the teachers and pupils about the important of watering and caring for their gardens. At Sbongumbomvu there were similar themes with the children learning how to create swales in the soil to channel the water and the importance of removing rubbish that has been dumped near the garden and of course the 3 R’s, Reduce, Reuse Recycle! The Superbug Club has also received funding from Thatu in 2017 and we had a wonderful recent update in the June report about their ‘Trashion Show’. The children were asked to make outfits and accessories out of ‘trash’ and had to showcase their creativity at the community event which had the wonderful benefits of boosting self-esteem, promoting creativity and engendering a fabulous community spirit.